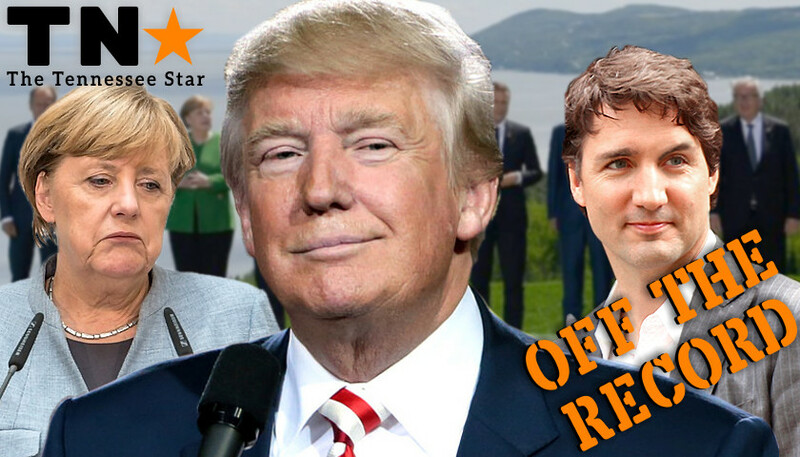 After years of mundanity surrounding the G7 world trade summit – the once-a-year snore-fest where the six, or seven, (or eight) leaders of the West come together as frenemies to see who can pick each others’ pockets most stealthily – we were treated to perhaps the most entertaining piece of political theater the world has ever seen. The excitement began when President Trump arrived. Last year, you’ll remember he made headlines over his ‘step aside‘ moment caught on camera. And you might also remember that – apart from the typical preening over ‘climate change’ initiatives like the Paris Accord (and the United States’ refusal to sign on) – the meeting came and went without much notice. Heck – even the protesters didn’t even bother to show up. The reason why is simple enough: this was President Trump’s first visit, and I suspect he wanted to do two things: (1) Observe; and (2) Give our trading partners a chance to do the right thing on their own. After all, that’s what friends do, right? Well, it’s a year later, and President Trump has been very vocal – some might even say notorious! – about his positions on trade. Surely they knew what was coming … ! But alas, it seems not. TRUMP: Oh – you mean you won’t lower the trade barriers to American goods? G7 Leaders: No, and how dare you ask! Tariffs and trade wars they create are the worst – just like you! Also, shut up. Trump: Just a few tariffs to get your attention. I would much prefer no tariffs at all – like I suggested. And yes, tariffs do made things more difficult… which is makes me I wonder why you continue to tariff us to the extraordinary extent you do. TRUMP: Welp – it’s been swell, but I’ve got to go to Singapore. G7: But what about our joint statement? TRUMP: Nah – we’re good. Thanks anyway. See ya! We’ve all seen the tremendous image captured and then disseminated by the German delegation. You read that right! German Chancellor Angela Merkel’s own people took that picture, said to each other, ‘yeah – this one is perfect!,’ and then pushed it out via Instagram to the world, much to the amusement and delight of Americans from coast-to-coast. In a word: GLORIOUS. Personally, I plan to print this on canvas, frame it, and hang it in my office. Of course, the internet went wild with it, and soon several memes came along. It was all over, we thought. There couldn’t possibly be any way to out-do this incredible life-imitating-art moment. Yes, that’s right. Here came Prime Minister Justin “Little Potato” Trudeau, and he was in a temper. How dare President Trump confront him on his trade agenda! How dare he ask for tariffs to be removed, or be met with the same! How. DARE. He. The fresh-faced Canadian was beyond umbrage. Past offended. He was literally sweating with indignation. Justin Trudeau wears fake eyebrows… that fell off after he met with Trump st G-7. Of course, we may never know the truth, but by golly – we should never stop searching for the answers. I’m still laughing and most likely will continue whenever I recall seeing all of this. Trump is showing them up for want they are, Idiots dressed up in “costumes” for “on stage acting”. Trump is showing the world what a “Real American” can do when they put “America First”. Too bad not enough other people are willing to stand up as strong as Trump for America.